The Akbar Shah diamond is a historic diamond of the early 17th century associated with the great Mogul Emperor Akbar the Great and his successors Jehangir Shah and Shah Jehan. The diamond gets its name from Emperor Akbar (1556-1605), whose name is inscribed on the diamond in Arabic. The English translation of this inscription reads as follows :- Shah Akbar, Shah of the world, 1028 A.H.
"The Great Diamonds of the World," in which the diamond is said to have weighed 120 Arabic carats or 116 English carats. It is also said to have adorned one of the eyes of the peacock in the renowned peacock throne of Shah Jehan. Besides this nothing is said about the color, clarity or the shape/cut of the diamond. Being a diamond of Indian origin we may assume the color of the stone to be white or colorless, one of the commonest colors of most of the historic Indian diamonds, that originated in the diamond mines of the Southern India, including the famous Golconda diamonds. In every respect a very remarkable stone the "Akbar Shah" entirely disappeared about the close of the seventeenth century, but it has again recently come to light. Thanks to information courteously communicated to us by Messrs George Blogg & Co. of London, we are enabled to trace its history back to the famous Mogul Emperor Akbar Shah, apparently its first owner. It remained in the Mogul's treasury till the time of Shah Jehan, by whom it was beautifully engraved in Arabic characters on both sides. After its long disappearance it suddenly came to light again a few years ago in Turkey, where it was known by the name of "Shepherd Stone." But the two inscriptions left no doubt as to its true origin. Mr. George Blogg who purchased it at Constantinople, in February 1866, was told at the time that according to the tradition, it formed one of the eyes of the Peacock Throne, destroyed by Nadir Shah. By him it was brought to London, where it was re-cut to a drop as the most advantageous form by the late Mr. L. M. Auerhaan. It was then sold by Messrs Blogg to the notorious Gaekwar of Baroda, in 1867 for 3 ½ lacs of rupees (£35,000), and now lies hidden away with the other treasures accumulated by that prince during his oppressive reign. 1) Shah Akbar -Shah of the world - 1028 A. H.
The date on No 1, 1028 A. H. corresponds to 1650 A. D. But Akbar who succeeded Humayun in 1556, died in 1605. Hence the Inscription could not have been engraved by Akbar himself. The date obviously indicates the year when Shah Jahaan caused it to be made, while the terms of the inscription record the fact that the stone had belonged to Akbar. The second inscription was evidently added eleven years later on, also by Shah Jehan, the then owner who reigned from 1627 to 1666, his reign thus covering both dates. The year 1028 A. H. he says corresponds to 1650 A. D. which is not correct. It actually corresponds to 1619 A. D.
He says that Shah Jehan reigned from 1627 to 1666, which is also incorrect. Shah Jehan's period of rule is actually from 1627 to 1658. Thus the year 1028 A. H. in the first inscription which is equivalent to 1619 A. D. actually corresponds with the period of rule of Jahangir Shah, 14 years after the death of Akbar the Great. Thus the first inscription must have been engraved under the instructions of Jahangir Shah, who perhaps would have been keen in perpetuating the memory of his great father. The year 1039 A. H. in the second inscription is equivalent to 1630 A. D. This corresponds with the period of rule of Emperor Shah Jahaan, just three years after he ascended the throne. Shah Jahaan had a penchant for inscribing his name on diamonds, and his name appears on two other famous diamonds of the Mogul period, the Shah diamond, and the Taj Mahal diamond. The next question is how the diamond belonging to the Mogul Emperors eventfully reached the west. 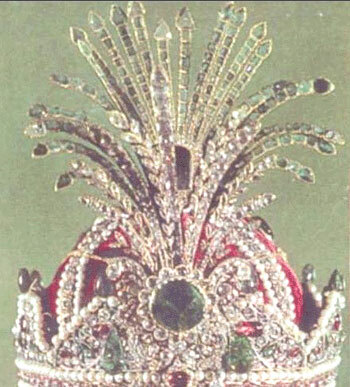 If as stated in Edwin Streeter's account the Akbar Shah diamond formed one of the eyes of the renowned Peacock Throne of Shah Jahaan which was dismantled by Nadir Shah of Persia, then after Shah Jahan, the diamond must have descended down the line of the following Mogul Emperors, until it reached Muhammad Shah in 1719. 1) Emperor Aurangzeb - 1658 to 1707. 2) Bahadur Shah - 1707 to 1712. 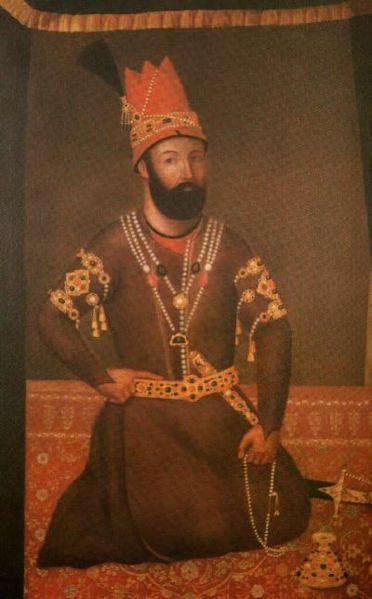 3) Jahandar Shah - 1712 to 1713. 4) Farruk Siyar - 1713 to 1719. 5) Muhammad Shah - 1719 to 1748. It was during the reign of Muhammad Shah in February 1739, that Nadir Shah, the ruler and conqueror of neighboring Persia, who was successful in creating a vast empire that stretched from the Indus river to the Caucasus mountains, invaded Northern India and captured Delhi and Agra after defeating the forces of Muhammad Shah. Nadir Shah's forces sacked Delhi and Agra, and eventually when his army left in May 1739, carried with them a booty estimated at 70 crores (700 million rupees), which helped him to exempt all Iranians from taxes for the next three years. His plunder included most of the crown jewels of the Mogul Emperors which consisted of the Koh-i-Noor, the Darya-i-Noor, Nur-ul-Ain, and the renowned Peacock Throne of Shah Jahaan. After Nadir Shah's assassination in 1749. most of his treasures were stolen by his close associates and commanders. Some of them were lost forever, but some were recovered later by the founder of the Qajar dynasty Agha Muhammad Khan Qajar. The Peacock throne was also dismantled after Nadir Shah's death and the jewels in the throne were stolen. The Akbar Shah diamond which was mounted on the throne was also lost in the process. The diamond that was stolen in the 1740s eventually appeared in Istanbul in Turkey in 1866, and was purchased by Mr. George Blogg of London, who got the stone re-cut into a drop-shaped diamond of 71 to 72 carats, which also unfortunately erased the two inscriptions on the diamond. The diamond was later sold to Mulhar Rao, the Gaekwar of Baroda, and had remained in the Gaekwar family until as recently as 1988, when Fatehsinhrao Gaekwad and his wife Shantadevi had declared the diamond together with the Star of the South diamond, and Empress Eugenie, as part of their valuables in the wealth tax returns for 1988. The Diamond Shah is 88,7 carat 3 cm long, yellow diamond, extremely clear. This diamond was found in Central India, probably in 1450. It was rendered to the shah court in Ahmad nagar. In 1591, Shah Nizam ordered carving on one of the facts of the diamond: Burhan-Nizam-Shah Second. Year 1000. 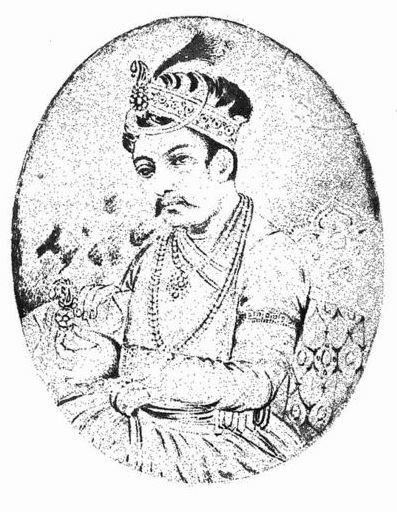 In the same 1591, the ruler of the Northern India, the Great Mogul Akbar, occupied Ahmad nagar and seized the diamond. After Akbar grandson, Shah Jehan came to the throne of Great Moguls, he commanded to carve another inscription: "The son of Jehangir-Shah Jehan-Shah. Year 1051". By the modern calendar, it was 1641. 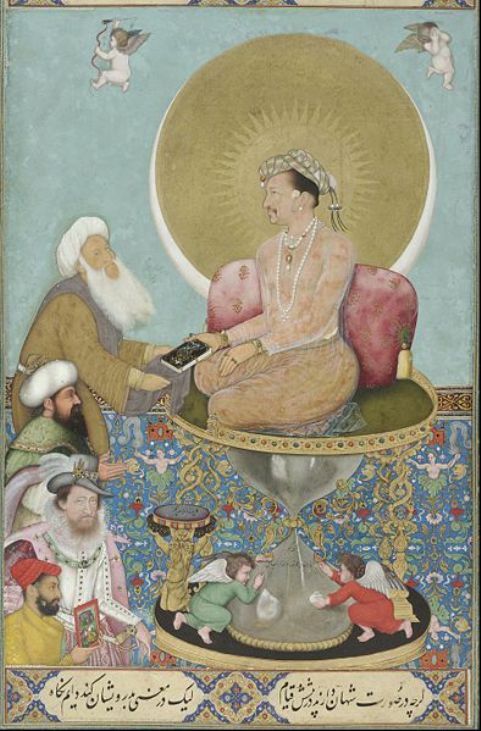 The son of Jehan-shah Aureng-Zeb hung the diamond above his throne and encircled it with rubies and emeralds. Till 1738, the diamond Shah was kept in Delhi. In 1738, Nadir Shah attacked India, seized the diamond, and took it to Persia. 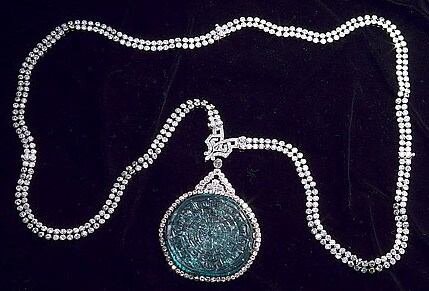 In 1824, the third inscription appeared on the third facet: "The ruler of the Kadgar-Fath ali-shah Sultan. Year 1242". In 1829, Russian diplomat and writer Alexandr Griboyedov was murdered in the capital of Persia, Tehran. The Russian government demanded severe punishment of those responsible. In fear, the court of Shah Fath Ali Shah sent the Shah's son Hosrov-Mirza to Saint Petersburg, where he gave the Shah diamond to the Russian Tsar as a present. Thus, the Shah diamond came to the Kremlin Diamond Fund, where it is exhibited as one of Seven Historical Gems. Will you purchase my diamond?